Jeffrey, a Member of the Firm, focuses on all aspects of real property transactions and has more than ten year’s experience in matters ranging from purchase and sale of undeveloped rural land to multi-tiered financing of urban shopping centers and condominiums. 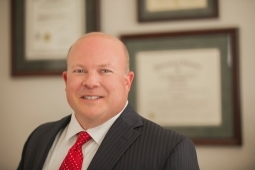 He is an approved attorney for Investors Title Insurance Company, Fidelity Title Insurance Company, Chicago Title Insurance Company, Statewide Title Insurance Company, Title Insurance Company of North Carolina, Inc., First American Title Insurance Company and many others. Jeffrey also acts as Trustee or represents lenders in foreclosure actions state-wide, both before the Clerk and in Superior Court, and is the North Carolina counsel for a national foreclosure servicer. He lectures continuing legal education classes and has testified in Superior Court as an expert witness regarding the law of foreclosure in North Carolina. Jeffrey also represents community associations throughout North Carolina, primarily in collections and covenants enforcement. Member, Professional Associates Network, The Historic Preservation Foundation of North Carolina, Inc.